How would you like to come to a place that welcomes people of all races, religions, sexual orientations and social backgrounds, in dignity and love? A place where they believe in diversity and provide a multitude of opportunities for anyone, in any stage of life, to grow spiritually? Imagine a place that communicates and celebrates the positive aspects of humankind, the world around us, and our relationship to the power within. What would it be like to be a part of a spiritual community that is metaphysical as well as practical and provides tangible steps toward immediate change? What if you could find a place that is alive and exciting on Sunday Celebration Services – a place that leaves you feeling wonderful and optimistic about your life and the world? Well, look no further! You’ve found your spiritual home and it’s waiting for you at the Hope Interfaith Center! 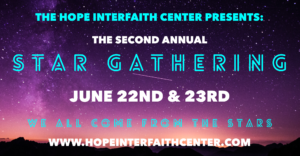 The Hope Interfaith Center is a spiritual community that honors all paths to God and to Source and can help you experience the powerful Love Source that you are. When we have a personal relationship with the truth of who we are, then other areas of our lives fall into place – we are happier and indeed then living a life of joy, bliss and inner peace. We then seem to do more for others, be better stewards of the Earth, and help bring peace and harmony to the world. If you are in search of a spiritual community where you are respected and accepted for who you are and you want the feeling of spirit and want the inspiration and support to grow to your highest potential, please accept our invitation to visit us soon! When you come to the Center, we would ask that you remove your shoes if possible. There are mats and cubbies that will hold your shoes. This is not only to help keep the Center clean but it is also a way of honoring the sacredness of the space. Thank you!